in our survey conducted across three fan forums. One of the promises that Charles Green made when his consortium saved the club was to launch a share issue by the end of 2012, and in December the company was floated on the AIM market in London. The purposes of this Initial Public Offering were to enable supporters to buy shares in the club that they had lost through the old company entering liquidation and to collect funds for various planned improvements to the stadium, the surrounding area, Ally McCoist’s transfer budget and for working capital. According to the share prospectus, £5.5m of the IPO will be set aside for Ibrox Stadium upgrades, £4.5m to purchase land assets adjacent to Ibrox and £3m for other projects that would bring additional revenue streams and working capital (no figure given). I set up polls on three fans forums – Follow Follow, Rangers Media and the CRO’s de-facto forum DoTheBouncy. The polling question was, ‘What do the fans want done with IPO funds for Ibrox/surrounding area?’ with eight ideas as well as an ‘Other’ option. I left out the idea of making Edmiston House a club store with an attached bar, as Green has mentioned this as a possibility already. With 81 votes, a dedicated club museum celebrating Rangers’ past and present achievements of the last 141 years was the most popular idea. Many large clubs have museums, and the fans clearly feel it was about time that Rangers had one. With all the success that the great club has had, there wouldn’t be a shortage in filling the museum. Our friends at The Rangers Standard created a petition for the club to consider a museum and have garnered nearly 2,000 signatures so far. Improving the general condition of the stadium in relation to concourses and toilets was the second most popular, with 65 of the votes. 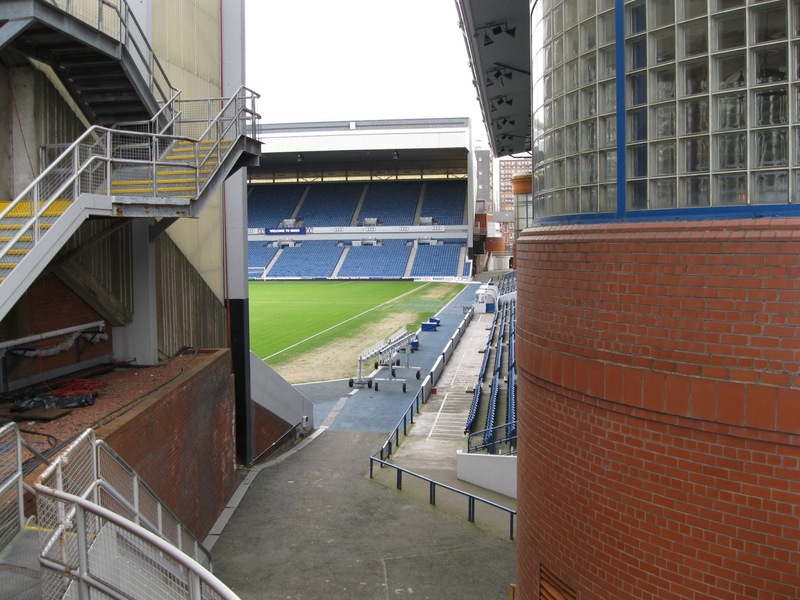 Any regular visitor to Ibrox will know that not all of the concourses around the ground are what you would class as “top-notch.” Some irregularities between certain stands and how they are kept day-to-day are clearly an issue for many of the supporters. An issue that many fans would like to see cleared up is the exterior state of the Broomloan Road and Copland Road stands. A general cleaning of the stands from the outside, or perhaps a modernisation of the outside façade are options the club could look at. The glorious Main Stand exterior needs no work but certainly the two stands behind each goal could do with some improvement works. The standard of the food and drink on offer at Ibrox has never been significantly high and revamping the standard of the product on offer and a re-design of the booths were a popular idea in the polls. A wider selection of the products is also wanted. Some even suggested a Rangers-owned McDonald’s franchise, either to replace the booths currently there or to build one outside the ground. The last proposed idea to make it into the cut is the much talked about casino/hotel complex. An idea of former owner David Murray that never took off, a casino in the surrounding area of the stadium could potentially be a banker for the club. With the idea of a hotel joined on also, some have questioned if the funding needed to construct the complex would be worthwhile for the money taken in once it was up and running. An honourable mention goes to the idea of safe standing at Ibrox, which personally I think is a superb idea and one I’d be eager to see get up and running. However, ripping up the seats in the Copland Front to introduce terracing again is probably not high on the club’s agenda for spending IPO funds – but perhaps it is one that can be set aside for a time in the future where the landscape of football could be a lot different to how it is today in 2013.